Nikola Tesla, one of the most influential inventors of the 20th century, spent his life working with electricity and dreamed of the possibility of wireless communication. Although he died about 30 years before the first call was made on a wireless cell phone, his work is invaluable to the technology available today. What could be a more fitting tribute to this man than a statue in his likeness that is equipped with free Wifi? 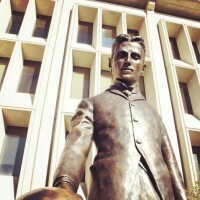 Standing at Tesla’s actual height of 6'2", the bronze tribute sculpted by Terry Guyer features Tesla holding a giant wireless light bulb. In addition to providing complimentary Wi-Fi to those visiting its new home in Silicon Valley, the statue also houses a time capsule to be opened on January 7, 2043—the 100th anniversary of Tesla’s death. Well known as specialists both in Switzerland and abroad in the fields of micro technology and micro-mechanics, the Swiss company, Mimotec SA, has been developed a UV-LIGA Technology in order to provide qualitative micro components, mainly for horology movements or micro technology mechanisms. Integrating graphene sheets into silicon photonics could form the basis for next-generation data communications. Researchers from the Graphene Flagship initiative have pushed the technology closer to application by demonstrating the world's first high-speed graphene-based data communication at a data rate of 50 Gb/s.